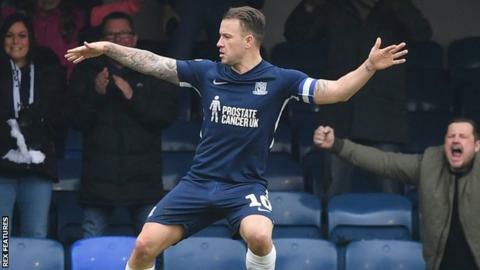 Simon Cox's hat-trick enabled Southend to hit back from 3-0 down to draw with League One promotion chasers Portsmouth at Roots Hall. Portsmouth took the lead after just eight minutes when Jamal Lowe's right wing cross was fumbled by Southend goalkeeper Nathan Bishop, enabling Bryn Morris to slam the ball home from close range. The visitors doubled their lead in the 21st minute when Ben Close fired a low 20-yard shot into the bottom right hand corner of the net. And it was three for the visitors 10 minutes later when Oli Hawkins netted from close range after Morris' shot had bounced back off the left post. Southend got a goal back in the 36th minute with Cox heading home Sam Hart's left wing cross. Cox then set up an exciting finish when he netted a 78th minute penalty, after Michael Kightly had been fouled by Morris. And the striker earned a point for his team three minutes from time with a fine curling effort, after being teed up by Timothee Dieng.